The Geothermal Resources Council Annual Meeting is promoting geothermal power as an ideal energy source with the theme of “Geothermal: Reliable, Renewable, Global”. The world’s largest annual geothermal event is taking place September 30-October 3, 2012, in Reno, Nevada, at the Peppermill Resort Spa. Geothermal power is ready to help meet our planet’s energy needs now and for the foreseeable future. Reliable: As a baseload renewable energy resource, geothermal produces power 24 hours a day, 7 days a week regardless of the weather, providing a uniquely reliable and continuous source of clean energy. Renewable: Geothermal power plants emit very few greenhouse gases or other pollutants and have small land-use footprints. In addition, the source of geothermal power, heat generated and stored in the earth’s solid core and mantle, is virtually limitless. Global: There are more than 24 countries generating geothermal power; new plants are planned in 43 countries. Geothermal power plants are present on all continents except for Antarctica. With new technologies even more areas of the planet are open for geothermal exploration. The GRC Annual Meeting is the industry’s largest annual gathering of leading geothermal energy researchers, producers, renewable energy industry stakeholders, regulators, utilities, and key associated business leaders. The four-day event will offer technical, policy, and market conference sessions, educational seminars, tours of local geothermal and renewable energy projects, and numerous networking opportunities. 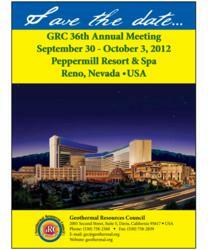 The GRC Annual Meeting in Reno, Nevada, from September 30-October 3, 2012, supports the world-wide geothermal community and promotes “Geothermal: Reliable, Renewable, Global”. The deadline for submission of draft papers for consideration for the technical sessions is May 4, 2012. Additional information about paper requirements and submission forms can be obtained by contacting the GRC at (530) 758-2360 or at http://www.geothermal.org. For information on how to sponsor this event, contact Estela Smith, GRC, (530) 758-2360 orgrc(AT)geothermal(DOT)org. With the experience and dedication of its diverse, international membership bolstering a more than 40-year track record, the Geothermal Resources Council has built a solid reputation as the world’s preeminent geothermal association. The GRC serves as a focal point for continuing professional development for its members through its outreach, information transfer and education services. For more information, please visit http://www.geothermal.org. Get your daily geothermal news at Global Geothermal News (geothermalresourcescouncil.blogspot.com). Become a fan on Facebook (facebook.com/GeothermalResourcesCouncil). Follow GRC on Twitter (twitter.com/GRC2001). Check out GRC’s YouTube Channel (youtube.com/GeothermalCouncil).